While they are leaner and smaller than their mightier and bulkier cousins the Malamutes, Siberian Huskies or simply Huskies are a class of their own. They have this certain look that makes them more like wolves yet are very intelligent and athletic that they can match other work dogs like the Belgian Malinois and the German Shepherd. Highly valued for their resilience, Huskies have been the favored work dogs of the peoples of the Siberian Arctic particularly the Chukchi. These dogs have been especially conditioned to last through the harsh Arctic winters, hauling cargo on sleds over long distances with very minimal water and food. You might think that these dogs will require a sumptuous meal. On the contrary, they are especially built for survival in the wild where food is scarce. But this doesn’t mean the Siberian husky you keep at home should receive the same kind of treatment. Like all members of the canine family, Huskies require the right balance and amounts of nutrients commensurate to their activity levels, age, and health condition. Generally, they need high protein and fat diets. And in case you’re wondering what you need to feed them, we’ve got you covered. 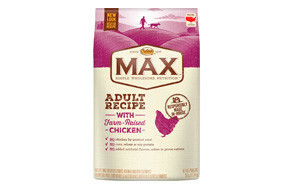 Boasting of a commendable combination of proteins and fats, Nutro’s MAX Adult Recipe with Farm-Raised Chicken is one of the best dry dog food for Siberian husky considering that it also doesn’t contain unnecessary cereal grains as well as byproduct meals. Nutro’s formulation is fortified with botanicals like spearmint, rosemary, and green tea that should work exceptionally well with its rich supply of natural antioxidants such as Vitamins E and A.
Nutro also features chickpeas, brown rice, and oatmeal, perfect for supplying readily available energy for the highly active husky. Nutro’s MAX Adult Recipe is a splendid choice for pet owners who may require an inexpensive yet highly nutritious and equally safe dog food Huskies. Orijen is highly regarded when it comes to the best food for huskies as well as other breeds as each product is uniquely formulated to contain the highest levels of proteins and fats and mimics the natural food that these animals have in the wild. The Orijen Adult makes its way into our list of the best dog food for huskies primarily for its exceptional nutrient composition of 90 percent meats, fish, and poultry and 10% fruits, botanicals, and vegetables. 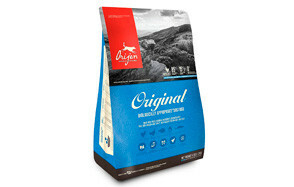 Technically, Orijen prides itself of using only the best quality ingredients that dogs in the wild are known to consume. It still has carbs though; however, these have been carefully selected because of their low glycemic index scores. The Orijen Adult also comes with at least 35% fat in addition to its minimum protein content of 36%. The formulation comes with substances that help promote healthy bones and joints, too. Sadly, the Orijen Adult is simply let down by its hefty price tag with a 28.6-pound bag costing you about $250. But if you don’t mind the price and focus only on what it can do for your husky, then the Orijen Adult, based on our analysis, is simply the best dry dog food for Siberian husky. The Orijen Original should never be confused with the Orijen Adult. For starters, the Original contains a higher percentage of minimum protein but with a lesser proportion of fat at about 18% minimum, compared to the Adult’s 35% minimum. Nevertheless, compared to other products in this list, the 18% minimum fat of the Original is still very formidable. What we really like about the Original is that its first 15, not 5, ingredients are actually animal sources of proteins and fats. Another noteworthy feature of the Orijen Original is that it comes with the most ideal ratio of the two most important fatty acids omega 3 and omega 6 at 1:4. Regrettably, the Orijen Original is well beyond the financial capacity of the average Siberian husky owner with a 4.5 pound bag costing more than $25. Regardless, if one truly loves his husky, then the Orijen Original is simply the best Siberian husky dog food. Blue Buffalo’s entry into this collection of the best Siberian husky dog food products is the BLUE Life Protection Formula that comes fully enriched with the fermentation products of 5 gut-friendly probiotic organisms. Blue Buffalo also provides a near-ideal fatty acid ratio of 1:5. Like all Blue Buffalo products, the Life Protection Formula features the LifeSource Bits technology which essentially packs all the nutritious goodness of its ingredients into each kibble. And speaking of ingredients, this formulation lists lamb and turkey meal as its 2 principal ingredients. It is not really grain-free, omitting cereals from its blend and opting instead for healthier whole grains. It’s priced reasonably, too, with a 30-pound bag costing you less than $50. At least, you get optimum nutrition for your husky at a price that won’t see you filing for bankruptcy anytime soon. What makes the Wellness CORE quite exceptional is that it is almost similar in nutrient profile to the Orijen Original, except that Wellness CORE enjoys the trust of thousands of dog owners. Perhaps this is because it is more than 3 times cheaper than the Orijen Original?Its high protein content, third only to the tandem of Origen Original and Adult, is perfect for the growing husky. This Siberian husky dog food from Wellness comes with 3 animal proteins in its 1st five ingredients and beefed up with vegetables and fruits, but none of the cereal grains. Each pound of the Wellness CORE contains 80 million colony forming units of probiotics. This dog food for huskies also come with chondroitin and glucosamine, substances that can help promote healthier joints of huskies. It is priced higher than the Blue Life Protection Formula at about $65 to $70 per 26-pound bag. On the good side, it is still more than twice inexpensive than Orijen Original. If there’s one thing that clearly separates the Taste of the Wild dog food for huskies, then that would be its penchant for using only novel proteins. 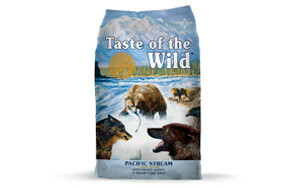 Take for example its Pacific Stream Canine Formula that contains salmon caught in the wild. It does have a higher omega-6 to omega-3 ratio at 8:1. Compare this to Orijen Original’s ideal 4:1 ratio and you can see why we’re quite apprehensive. Nevertheless, we think TOTW has managed to balance this with the inclusion of 3 probiotic strains that are known to improve the functioning of the immune system. Plus, the addition of vitamin E and other antioxidants can help negate the unusually higher proportions of omega-6 fatty acids. If there’s any consolation, you’re giving your husky food that is quite out of the ordinary because of its novel proteins. Moreover, it’s a lot cheaper than the Orijen, Blue, and Wellness CORE. If you’re a first-time owner of a Siberian husky, chances are you’re wondering what food you need to buy for it. Should it be dry kibbles? Raw? How about wet dog food? You may also find yourself asking the number of calories you need to give it on a daily basis as well as the best type of diet for this breed of pooch. All of these are valid concerns. After all you only want the best for your pooch. There are plenty of online resources when it comes to feeding a Siberian husky. But before we share with you this comprehensive guide to buying a husky food, we just would like to reiterate the importance of seeking the advice of your pet’s veterinarian. Products come with serving recommendations but these are often based on a healthy adult husky. A thorough assessment by your vet should provide you with an idea as to the best husky dog food that you need to buy. How Much Food Do I Feed My Husky? Determining just how much food to give to a husky can be quite challenging since the very nature of these breed of dogs tells us that they don’t really require too much food. When they were first used by the Arctic peoples to haul their sleds over long distances, huskies had to do so without requiring too much food or water. They have learned to adapt through such adversities that they have become one of the most resilient canine breeds you could ever encounter. However, as huskies are now finding their way into modern hoes where the ‘workload’ may not really be as heavy as what they have been genetically programmed for. There is one thing you need to understand about the feeding behavior of huskies that are quite unique to the breed. Unlike other breeds that can chow down on almost any other type and amount of dog food that you provide them, huskies will typically display the following behaviors. If they are already full, they won’t eat. If they are not as active as they normally are, they will eat less. If they receive plenty of exercise, they will definitely eat more. So, how much food should you give your husky? It all depends on a variety of factors, but mostly dependent on the following. Husky puppies and seniors typically require fewer amounts of dog food per serving. However, this should not be misconstrued as necessarily skimping on their nutrient requirements as well. Puppies will require more proteins and fats in their diet while these levels are usually toned down a bit once the pup has reached the adult stage. Here’s the thing, if ancestral huskies can live with very minimal food despite working hard, does that mean inactive dogs will require significantly less amounts of food? As a general rule, the more active the pooch the greater is its need for calories. If it is not really exercising or is simply lying in its crate the whole day, then clearly there is no point in giving it too much food. It is for this reason that the amount of food we give to our dogs should be commensurate to their energy expenditures. As much as possible, there should be a balance between caloric intake and caloric expenditure; otherwise, if the intake is greater than the expenditure, then our huskies will risk becoming obese. In pretty much the same fashion as a husky’s activity level, its general health status will also help determine how much food you need to give. Puppies, as we already said will require lesser amount of food but rich in fat and protein. Pregnant huskies will need more food because they also have to feed the unborn puppies in their wombs. Breastfeeding female huskies will need more moisture, fats, and proteins in their diet as these are important in the production of milk that bring sustenance to husky puppies. Sick huskies may need to reduce or increase their food intake depending on their condition. What is clear from the foregoing discussion is that the amount of food we give to our pet Siberian huskies actually depends on a host of factors. While it would be safe to say that the usual recommended adult husky feeding amount is 1.5 to 2 cups of dry kibbles every day and divided into two separate meals, this typically refers to a healthy, normally active Siberian husky. That is why we strongly recommend having a chat with your vet so he can conduct a thorough health assessment of your husky. This will help create a better understanding of just how much calories it needs to consume on a daily basis. What Kind of Diet is Best for a Husky? The ancestral canine diet is mostly composed of fatty meats since fat contains high concentration of calories or energy. Imagine, when compared to a gram of carbohydrates that typically contains 3.5 calories of metabolizable energy, a similar amount of fat can pack a whopping 8.5 calories, more than twice that provided by carbs. Technically, the high fat diet of huskies that are still pretty much used in the North gives them the kind of energy they need for work. On the other hand, Siberian huskies that are now permanent members of modern-day families mostly in urban areas do not have an inherent need for such kinds of diets. However, this doesn’t mean that they should be given low-fat diets. In determining the best diet for a husky, one must consider some of the more unique feeding behaviors that this breed has. It easily gets bored with the same food over and over. A negative experience with a certain food will make a husky never to eat that food again. With these feeding characteristics of Siberian huskies, coming up with the best diet can be intimidating since giving them the same type of food day in and day out can lead to food boredom. This can result in your pooch eating less, diverting its boredom and frustration into other ways. Choosing a diet that they may have an adverse initial experience can also lead to them not wanting to eat that kind of food ever again. This can significantly narrow down your options as to what you can provide them. It is for this reason that experts recommend the following formula when it comes to a Siberian husky diet. A base dog food that provides exceptional proteins, fats, and micronutrients. A variety of food additions to enhance the flavor and palatability of the base dog food. The idea is to provide Siberian huskies with a food that they will never grow bored with and that is very palatable to them. Adding variety to the base food should help address this concern. Like all dogs, Siberian huskies require a specific amount of calories, proteins, and fats to help promote optimum canine health. The NRC of the National Academies recommends giving a 50-pound healthy adult husky with 1358 kilocalories per day. However, if the dog has already been spayed or neutered, this nutritional requirement can be lessened. On the other hand, as we have already discussed above, a husky that is very active will require more calories. Now here’s the thing. Since Siberian huskies are known to be exceptionally picky eaters, eating mostly in small amounts, it is imperative to provide them with energy-dense foods. That’s why a high-fat diet should come in handy. Here are the other nutritional requirements for a Siberian husky as recommended by the Association of American Feed Control Officials or the AAFCO. In addition to these macronutrients, the following micronutrients are also required for a Siberian husky. Siberian huskies are more prone to the development of a type of dermatitis that is caused by insufficient amounts of zinc in the dog’s blood. The disorder is hereditary and can usually be detected through a dog DNA test or if your pooch has a known familial history of the condition. Siberian huskies may not have the build of a Malamute. Nonetheless, they still require strong bones to help ensure optimum mobility. This is particularly important among husky puppies as their skeletal system is still developing. By the time they reach adulthood, they may only require maintenance amounts of these minerals. Since huskies have quite a reputation when it comes to being finicky eaters, they need to absorb every bit of nutrient that is found in their food. Providing your pet with a husky food that contains live gut-friendly microorganisms can help provide for healthier digestive system which allows for the more effective absorption of nutrients. Additionally, these probiotics can help boost the functioning of the immune system. Valued as a powerful antioxidant, the inclusion of Vitamin E in the diet of a Siberian husky is needed to promote and maintain the health of its coat. You have to admit that one of the most distinguishing characteristics of a husky is its coat. Siberian huskies are tough. They are known to be highly resilient against food allergies especially those brought about by cereal grains. As such, they can eat virtually anything. However, this doesn’t give you the go-signal to feed them any other food. Like all canids there are certain food items that you should never give to your husky. Containing theobromine that is a known cardiac stimulant, chocolates are a big no-no in canine feeding. While current research suggests that milk or white chocolates, in small amounts, can be considered safe for dogs, it is generally not a good idea to tempt fate. These mainstays in any culinary creation contain substances that are known to destroy your Siberian husky’s red blood cells. This can lead to anemia, making your husky feel so weak and lethargic. Dairy products like milk are rich in calcium as well as proteins and fats. Unfortunately, giving your Siberian husky too much of these products can produce gastrointestinal symptoms like diarrhea and cramping. While huskies are known to have exceptional tummies, you’ll never know if your pooch is one of those unlucky few that may have lactose intolerance. We did say that Siberian huskies require fat in their diet. However, fat trimmings should always be avoided since these often come with high concentrations of unhealthy fats. This can predispose your dog to the development of pancreatitis. Cooked bones are a no-no, too, especially those from poultry like chicken and turkey as these can break easily producing sharp splinters that can injure the lining of your husky’s stomach or intestines. Siberian huskies are very intelligent, albeit stubborn pets especially when it comes to food. As resilient as they may be, huskies still require the correct nutrients for their growth and development. They need high protein and fat diet in sufficient amounts that are commensurate to their age, activity level, and health status. With this list of the best dog food for huskies we are optimistic that you are now better informed about the correct nutrition for your wolf-like pet.